Montgomery Kennelworth really enjoys doing his own decorating. He fully enjoys the boring bits, like sanding down the woodwork and stripping off the old wallpaper. Dorothy Kennelworth is a workaholic and loves to help Montgomery. If she's not doing this she's doing that. In fact she seems to be doing 101 things all at the same time. Clara Kennelworth is altogether more serious. She loves doing crosswords and lots of different competitions. 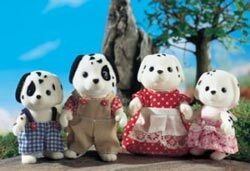 But most of all, her favourite is the "Sylvanian Spot the Difference" competition in the local paper. Rufus Kennelworth is an easy-going, fun loving little boy. As everything seems so simple to him; his father says that: "He sees everything in black and white".